I’ve never written anything controversial on this site but this post may change that. Let me make something clear right up front. If you and your family have been visiting Cummins Falls for years and you love it and take all your friends, I think that’s great and I encourage you to continue making that choice for your family fun. 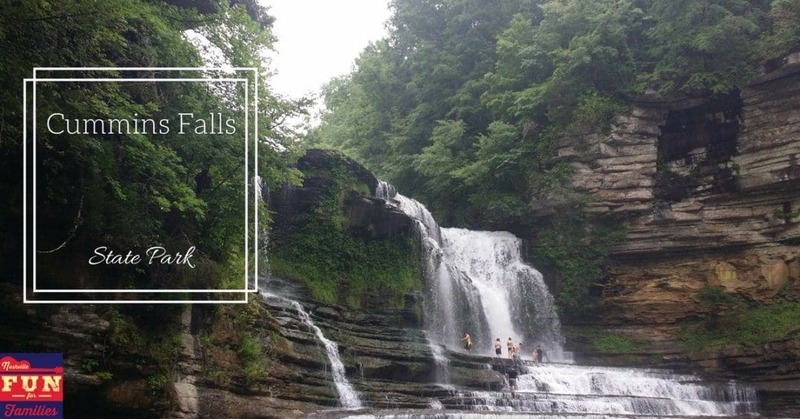 BUT if you haven’t visited Cummins Falls before, read my concerns before you plan a trip. Cummins Falls is a Tennessee State Park that people have been telling me about for years. I’ve planned to go year after year but, for whatever reason, never made it there until this week. A friend of mine invited me and my daughter. She and her teen sons visit quite a bit so I was happy to accept her invitation and hike to the falls with an experienced family. I am not, in any way a daredevil. I would describe myself as risk averse. Danger is not my middle name. I do tend to be a tad over protective of my children and I’m not ashamed of that. I’m telling you these things about myself so that you can view my thoughts on the hike to the falls through the lens of my personality quirks. The drive to the falls is an easy one from my home in Wilson County. It took about 1 hour and 15 minutes. My GPS took me right to the parking area with no trouble. There is adequate signage on the way also. There is a public restroom facility located near the parking lot at the entrance to the trail. It is equipped with a baby changing station. It was adequately clean on the day of our visit but it’s a public park restroom so don’t expect much in the way of amenities. Just a few yards from the parking area is the beginning of the trail. Expect the hike to the falls to take you around 45 minutes. Experienced hikers may be able to make it faster. As you begin the hike, it’s all downhill. (Remember, it will be uphill on the way out!) The trail is not a smooth surface. It alternates between a fine gravel and dirt. There are also lots of jagged rocks scattered throughout the trail. This is not the kind of hike where you can meander along and enjoy the scenery. You really have to watch every step you take.About 1/4 of the way into the hike, the terrain changes. For the rest of the hike to the falls, you will either be walking in the water (up to your ankle or mid calf) or on the rocky edges. The water is fairly clear which does allow you to at least see where you are stepping. But be aware that lots of the rocks underwater are very slippery. Go slowly. In retrospect, a walking stick for balance would have been really helpful. There are several places on the hike where the trail just disappears into an area that you just can’t cross easily. Be aware of the water levels as you hike to find the most shallow spots when you have to walk through the water. Toward the ends of the trail, I’ve got good news and bad news. The good news is you will be able to see the falls. And they are magnificent. The bad news is that the trail to them is just a series of giant boulders. I’m not trying to scare you. I just want you to know that getting to the falls is no easy trek. Once you make it over, you can swim at the bottom of the falls or climb up. My daughter and the other teens climbed up the falls and enjoyed it immensely. She did say that some of the climb was difficult and that the rock floor of the falls was moss covered and slippery. So, should you go to Cummins Falls for family fun? The answer depends on your family. If you have a bunch of adventurous older kids who will take safety precautions seriously and are in good physical condition, then a day at the falls might be an appropriate family outing. But if you have younger kids and/or you aren’t used to a lot to physical activity, then I think it would be wise to postpone a trip for a while. Cummins Falls is a breathtaking natural area. It is beautiful. It is awe inspiring. It could also be dangerous if you go unprepared. Here are some tips to consider if you decide to make a trip. Wear good shoes. This is not a hike for flip flops or cheap sandals. And be aware that your shoes are going to get wet. Don’t forget the sunscreen and bug spray. Travel light to the falls. We carried a drawstring style backpack with water, a towel, some snacks and a few first aid items. Cell coverage is not consistent. Our group used service with 2 of the 3 major carriers and we had zero coverage at the falls. This is an issue if one of your party gets injured. There are park rangers at Cummins Falls but we didn’t see any on the day of our visit. My intention here is not to scare you. But the possibility of a sprained ankle (or worse) is very real so I want to make you aware of these possible complications. Think seriously before taking a child that must be carried. There are many times when you will need both hands to get yourself from one part of the trail to another. I don’t see how you could do that with a baby or toddler. I’m not saying it hasn’t been done. I’m just making you aware of the possible drawbacks. Bring a change of clothes and leave them in your car. Even if you choose not to swim, there’s a good chance you will get wet on your hike to the falls. Having a dry set to change into when you return will make your whole party a lot more comfortable on the drive home. I’m almost willing to move to the area just to live near this waterfall. Never been there, but have passed Nashville going back and forth to visit family in the Midwest while living in the panhandle of Florida.